I have been eagerly awaiting the latest Bodhi and Birch release ever since I had a sneaky preview some time last year. 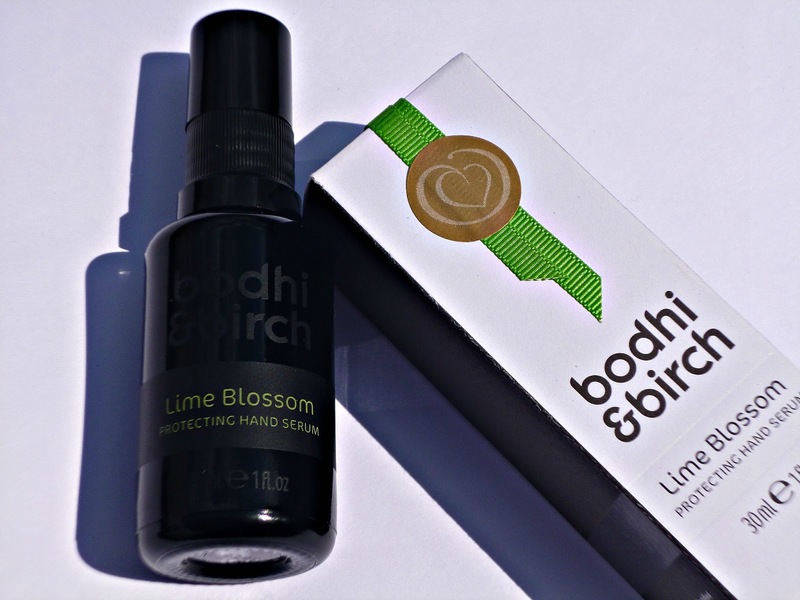 I have a lot of love for Bodhi and Birch and this new product the Lime blossom protecting hand serum has become one of my most loved Bodhi products ever alongside the Rosemary chi Himalayan detox body scrub. First off I love it because it is very unique, the market is full of hand creams, but this is really very different to anything else available. This is an oil based serum, packed full of anti-ageing and repairing ingredients, the main oil is olive squalane which I have already fallen in love with as a very light oil that gives a lovely dewy and plumping effect, squalane is a fantastic anti-ageing ingredient and I have yet to find anyone who didn’t love it’s gorgeous silky texture. Also in this beautiful product is Rosehip oil, Safflower oil and plum kernel oil as well as vitamins E and F, when you look at the ingredients you can see that this isn’t your average hand product but a real treat for the skin. All you need is one pump of this precious oil to take your hands from sandpaper dry to baby soft, I suffer from very dry skin and this has been such a lifesaver for me especially for those times when you don’t have time to apply hand cream but your skin is crying out for moisture. Bodhi and Birch recommend you use this on slightly damp skin, I have to admit I don’t always as my dry skin seems to just drink up all the serum anyway but it is really handy for anyone who has to wash their hands a lot such as new mums. Like every Bodhi and Birch product I own one of my favourite things about this is the scent, made up entirely of the essential oils of lime and green mandarin they also have the added benefit of being anti-bacterial and anti-sceptic which is always a welcome bonus in my house as we are always fighting off germs. The scent is a beautiful citrus as you would expect but it is also sweet without being sickly and sophisticated too, if you get a chance to smell it you will fall in love, I know I have. If you are someone who usually neglects their hands because you don’t like the feel of other hand treatments I think this one is seriously worth a look, my hands and my nails (as well as my nose!) have been in heaven since this arrived through my door, another winner from Bodhi and Birch and I have come to expect nothing less from my all time favourite brand.